Musings 'n scribblings of a philanthrope .. : Meet Padmasri Jadav Payeng, India's Forest man ..
Jadav Payeng, is the forest man of India. It is great to learn about this villager from Assam who on his own enterprise went on to plant 1360 acres of forest. 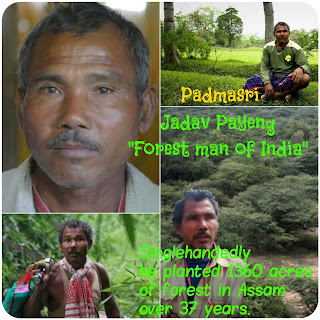 Click here for the news link on the Forest Man ..
Click here for the video on Jadav Payeng ..
Over 37 years he singlehandedly planted the forest, which presently is being inhabited by elephants, tigers, deers, bisons and many species of birds and snakes ..